This quilt is for the baby of dear friends and was gifted in the beginning of June. 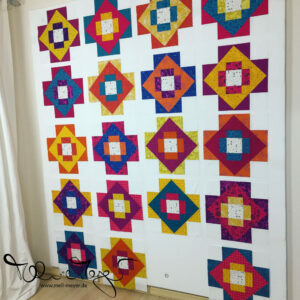 2016 Q1: They have decided on a a pattern, it will be Hopscotch by Camille Roskelley @ Thimble Blossoms. And they have picked the fabrics. I have already started cutting and am finished with the trapezoid shapes. The deadline is the end of May. 2015 Q2: Finished the blocks for the third border. 2015 Q3: Second border pieced and connected. And I made an appointment for quilting on a longarm. Deadline for the quilt top is now the 13. of December. 2015 Q4: Finished the top AND quilted it on the longarm. Now I have to bury the threads and bind it. And figure out a hanging option/ sleeve. Click here for the blogpost. 2016 Q1: Unfortunately no progress. I want this quilt hanging on my wall by the end of July for my birthday party so I have to finish it fast. It still needs some quilting stitches – some I strategically left out on the longarm because of even more starts and stops – a hanging system – I am concidering a velcro system on a wooden frame – and of course binding and a wash.
Q4 + Q1 + Q2: Unfortunately no progress. 2016 Q1: Finished the blocks for January/ February. No blog post – but I will „one day“ put up a „bee block page“. The blocks for March/ April are almost finished. Goal: Test out the block I have chosen for my month, because I am up next: May/ June. And then finish some and post the instructions for my bee members. So anytime now the blocks from my fellow bee members should come in. Additionally I think I have to make at least 20 more blocks. Finishing that quilt will probably take some time but it’s – as a quilt – now an official item on my list. The bee blocks for July/ August are already done, anyway. Ok, I cheated (a bit): Allison picked her fabrics when she was visiting. Then I just couldn’t let it sit that long and started. Now they are already finished, but still waiting for the official time to be given. 2015 Q3: I have quilted some of my previous blocks and I did as well work on some more blocks. But the backlog is still huge. We do now have all the tutorials, so I could finish it – ähh catch up. I would actually love to work on this one, too. But in reality it is often just too much. So I have pulled it out of it’s box and I hope that will annoy me so much that I really pull it to the front row. 2016 Q2: I did cut all the fabric for the HSTs and have finished sewing the sets. The cool colorway is already trimmed and the warm one is roughly have way through the trimming process. This is a new quilt. It’s going to be for the baby of a dear friend (again). And it’s still quite new in the making. But we have already picked a layout idea. 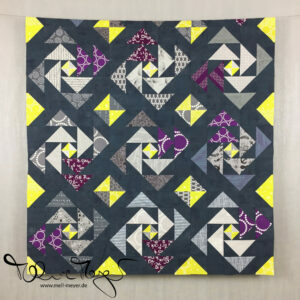 That picture is the reason for the strange working title :) The quilt is going to be in a dark grey background with the birds/ arrows beeing in bright rainbow colors. See the inspiration here and here. I am still debating wether to use a solid pure elments (Art Gallery) fabric I have on hand or to buy some grunge by BasicGrey (Moda). I am leaning heavily towards the second option. And if I finish (No. 2) Fourpatch as a charity quilt, that’s fine, too. 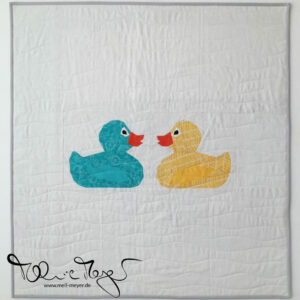 As I don’t know any German (Hamburg) quilters who would love to help with this idea, I think giving „just“ two or three mini baby quilts a year is not that much help. So I am trying to push myself a bit. Let’s see if it works out or not. I started a new board to pin some ideas to. I am especially fond of these one, two, three ideas. All of your quilts are beautiful, but the Aviatrix quilt is really astounding! Hope you get it finished and hung in time for your party!